dave: "this crepe is so good it was almost worth the wait." It’s not a great sign when the best thing you can say about a place is “this would be good for take out.” We had high hopes for Cafe Deia in Medford last Sunday, but damning with faint praise was all we could muster by the end of our meal. Deia is cute, tiny, and clean. You order at the counter, pay, and take a seat to wait for your meal. At which point you have a chance to wonder what you ordered (for two people, for breakfast, in Medford) that cost almost $30. 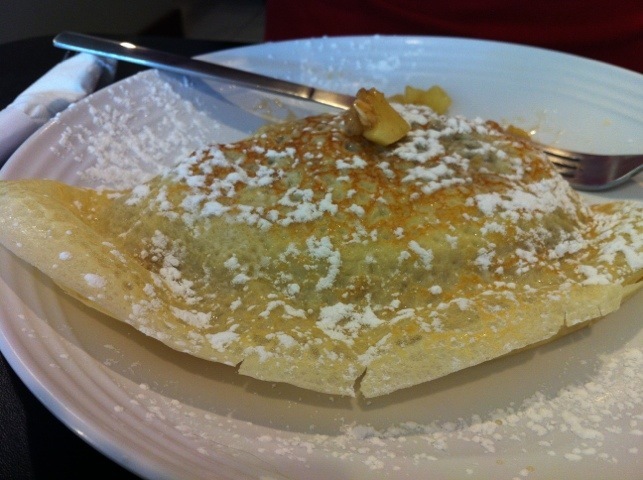 Two crepes -which do not include breakfast potatoes or toast – one iced coffee, and one small freshly squeezed juice. This should not add up to $27.50. I know, fresh juice is expensive, but $6 for a small? Come on. I could have dealt with the cost if the service had been passable, but it was not. My order of a bacon, egg, and cheese crepe came up quickly, and I sat with it in front of me for five minutes as we waited for Dave’s order to come out. It did not. Ten minutes later, still no sign. Diners came in, placed and received their orders, and left. Still no food for Dave. I peered over the counter and asked the woman behind the stove: “Hey there…do you have an order for an apple crisp crepe?” assuming she’d either say it was on its way or apologize for the mishap and start cooking it. In case you think you can predict the rest, there was no apology amidst the blank stares and shrugs from the counter staff. Dave had no food, and I was done with mine, but there would be no crepe made until Cafe Deia had painstakingly investigated exactly what had happened with the order, lest I attempt to pull a fast one and get a free breakfast. When Dave’s crepe finally came out (it was delicious, by the way), the chef did manage to throw a “sorry” our way, but I imagine that’s because we’d been verbally writing this review at our table a few feet away. You know, to pass the time. So, if your idea of a nice weekend breakfast is spending too much and being treated poorly while you eat at a completely different time than your dining partner, Cafe Deia is the place for you. If not, grab your crepes for take out and make some hashbrowns at home. Not going there any time soon but except for the cost it does remind me of Deluca’s in the strip.